What child is not intrigued by woolly bear caterpillars? Our little granddaughter, Elanor, certainly is. Last September she gathered up a handful of the bristly creatures as they paraded across our veranda and claimed them as pets. I tried to discourage her, but she was adamant, and her father, Steve, who is an amateur entomologist in his spare time, humored her. Later, I was relieved to learn that because woolly bear caterpillars are almost fully fed in the fall and will eat a wide variety of green plants that their pint-sized captors will feed them, they make good, short-term pets. 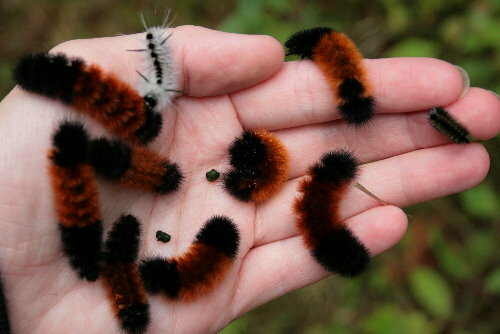 But folks in Banner Elk, North Carolina, take woolly bear caterpillar pet-owning to a much higher level. 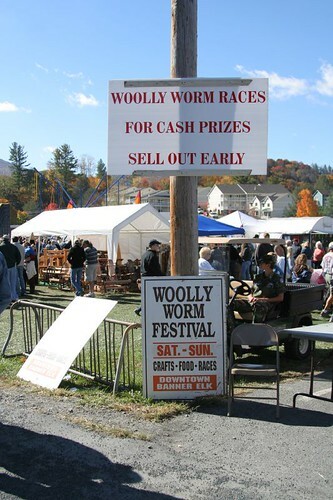 They hold a two-day, Woolly Worm Festival the third weekend in October. Although the festival has hundreds of food vendors and varied live entertainment, for 33 years it has focused on Woolly Worm Races. Last October, 1,604 racing caterpillars and their young trainers competed, and nine-year-old Noah Jens’ pet, Wilbur, won the thousand dollar prize. I don’t think I’ll accept that bit of folklore, because one woolly bear I saw last fall was almost entirely brown except for its black end, and we had a terrifically long and snowy winter. Furthermore, scientists claim that woolly bear caterpillars have six or seven instars and the older they are the more brown hairs they have; hence, my woolly bear was merely an old one. Still, I’m sure the Woolly Worm Festival, which had 20,000 attendees last fall, with its face-painting, dancing, and live bands, is a lot of fun and possibly the only festival in North America devoted to a caterpillar. The woolly bear, also called the “black-ended bear,” “fuzzy-wuzzy,” “woolly worm,” and “banded woolly bear,” spends the winter under leaf litter and boards, although we have them curled up on our outside cellar stairs and on our heated basement floor. Then, it pupates the following spring. Eventually, it morphs into the orange-yellow Isabella tiger moth—Pyrrharctica Isabella—one of 11,000 members of the Arctiidae family worldwide. Like many tiger moth caterpillars, they taste bad to predators so they don’t bother to hide during the day, but why they wander when they aren’t particular about their food, puzzles researchers. In fact, many temperate arctiids, which include such species on our property as milkweed tussock moths (Euchaetes egle), fall webworms (Hyphantria cunea), unexpected cycnias (Cycnia inopinatus), dogbane tiger moths (Cycnia tenera), virgin tiger moths (Grammia virgo), giant leopard moths (Hypercompe scribonia), Clymene’s haploas (Haploa clymene), and banded tussock moths (Halysidota tessellaris)—are the only abundant, widespread, and species-rich lineage of Lepidoptera that crawl over bare ground during the day in North America. Most are dietary generalists; fall webworms, for instance, eat over 400 plant species. 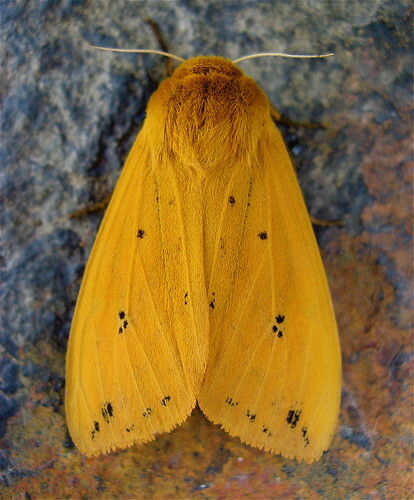 Yellow bears (Spilosoma virginica), which are common in gardens and yards of the eastern United States, like a host of low-growing plants as well as woody shrubs and trees. Instead of defending themselves, many arctiid caterpillars fall to the ground if they are disturbed or, like woolly bears and giant leopard moths, curl up in a ball. The gregarious fall webworms in their messy nests thrash their bodies from side to side in unison. Arctiid caterpillars also take part in “walkabouts” in the fall. A small peak in hormones that makes them stop eating, empty their guts, and search for a good place to spend the winter triggers this behavior. While most overwinter as half-grown caterpillars, some species, such as milkweed tussock moths, banded tussock moths, and fall webworms, overwinter as pupae. Arctiids are unpalatable to predators because either they have inborn noxious chemicals or obtain noxious chemicals through the plants they eat. The acquired chemicals are pyrrolizidine alkaloids (PAs) from principally the snakeroots and ragworts or cardenolids or cardiac glycosides found in milkweeds and dogbanes, which affect the hearts of vertebrates. Unexpected cycnias, though, are dietary specialists and only eat butterfly weeds, a species of milkweed. Arctiid caterpillars can also hear. Researcher Raeleen Wilson, who worked with milkweed tussock caterpillars, discovered that their tufts of secondary setae (hair-like outgrowths from their bodies) are actually their ears and suspects it is true for other arctiid caterpillars as well. She suggests whimsically that we should hum at other species of caterpillars and see if they react. Probably, they are listening for the wing beats of parasitoid wasps so they can hide. Fall webworms, for instance, are parasitized by more than 50 species of parasitic wasps and flies, creating what David L. Wagner in his Caterpillars of Eastern North America calls a “parasitoid hotel” in their nests. When arctiids metamorphize into moths, they have ears on the third and last segment of the thorax or body. Instead of flying in loops to avoid bats, they answer the bats ultrasonically. Even headless dogbane tiger moths will continue to click in response to bats as long as three hours after their decapitation. When moths ultrasound, bats break off their pursuit for one of three reasons, according to researchers. In the case of the southwestern tiger moth species Grote’s Bertholdia (Bertholdia trigona) and probably other species, as well, they jam the sonar of their main predators—big brown bats. For other tiger moths, the sounds startle the bat, giving the moths time to escape. Still other moths use their ultrasound to warn bats that they are toxic so the bats will leave them alone. But many species of arctiid moths, including the Isabella tiger moth, also use their ultrasonic buzzes for courtship. The males of most species emit these sounds before releasing pheromones (odors that attract another member of the same species) to attract females, but Isabella tiger moths, along with ruby tiger moths (Phragmatobia fuliginosa), are unique because only the females produce their ultrasonic buzzes. Sound is particularly important to milkweed tussock moths and other species that courtship feed on cardenolide plants because they don’t produce pheromones and need sound to attract mates. But in most arctiid species, a female begins the courtship process by releasing a volatile pheromone from a gland near the tip of her abdomen. This forms an odor plume that a male follows upwind to a female. Such a pheromone release is known as “calling” and occurs at a certain time of day or night depending on the species. To emit these pheromones, a female takes an elevated post with her wings in a V shape, turns her pheromone gland inside out and then rhythmically pumps out many droplets of pheromone once every few seconds and for several minutes at a time. Some of this scent enters the wind stream. The Isabella tiger moth is particularly adept at this, emitting copious amounts of her pheromone which wafts her odor plume farther downwind than most moths. A male tiger moth finds a calling female by flying upwind. If he loses contact with her odor plume, he practices “casting behavior,” by zigzagging laterally across the wind line until he makes upwind progress towards the female. Once he gets close, he emits ultrasonic clicks that she answers with her own clicks. Some arctiid males also have scent organs that they use during courtship to release pheromones. Apparently, they are advertising the fact that they have fed on PAs and can offer females a nuptial gift containing a defensive alkaloid that will protect them and when transferred to their eggs, their offspring. As researchers work with more of these interesting species, they discover fascinating variation in their behavior patterns. The dogbane tiger moth male emits a six-second sound at the same time as he releases a cloud of pheromone. If he can’t produce one of these cues, a female flees. A denizen of fields, powerline right-of-ways and other open habitats, one of these caterpillars that feed on dogbane will deposit 50 to 60 eggs on the underside of a dogbane leaf. The virgin tiger moth plays possum when it is handled roughly. It flips its wings over its thorax and curls its abdomen downward, conspicuously displaying its bright yellow-and-black coloration until danger is passed. The great leopard moth engages in chemical warfare by exposing its orange-marked, metallic blue abdomen and secreting an acrid-smelling solution from glands located in the first segment below its head. 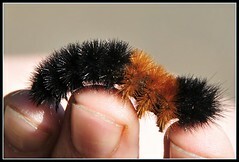 We see almost as many giant leopard moth caterpillars in the fall as we do the woolly bears. Large, black, and densely-covered with stiff bristles, they too eat a wide variety of plants including cherry, dandelion, oak, plantain, sunflower, violet and willow. They also spend the winter as caterpillars under logs and bark. Unfortunately, tachnid flies frequently parasitize them so they stay hidden in leaf litter or under loose bark during the day when the flies are abroad. Folks often find them when they are raking up leaves or cleaning their yards, but we see them out late in the fall after the flies are gone. The moth is large and white, its forewings and thorax boldly spotted with black, altogether a handsome moth. Some years we have a plague of banded tussock moths—hairy, yellow-brown caterpillars with black and white lashes at either end of their bodies. They feed on dozens of plants, including the black walnut trees encircling our front porch where we eat our dinner during the warm months. Since birds don’t like these distasteful caterpillars, they are conspicuous and sometimes invade our porch and table by the dozens, disgusting our visitors from the suburbs, but delighting their children and our grandchildren. Still another hairy caterpillar our granddaughter croons over is the handsome black and white hickory tussock moth (Lophocampa caryae), which also likes black walnut trees, in addition to hickory, ash, elm, oak, willow, and American hornbeam. They lay their eggs in large batches and during their early instars remain in clusters of 1000 or more caterpillars. Sometimes they irrupt and cause local defoliation, but I’ve never noticed such damage here. Trying to identify caterpillars and moths continues to be a challenge for me. One that intrigued me turned out to be still another tiger moth called Clymene’s haploa. With its wings closed, the brown marking on its cream-colored forewings makes an inverted cross. 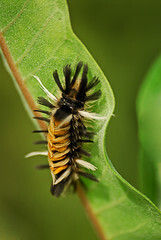 Its bristly, black and orange caterpillar specializes in PA-rich plants especially joe-pye weed and snakeroot. It overwinters as a caterpillar and pupates in early summer. Moths of most species and their caterpillars remain understudied, probably because so many of them come out only at night and/or are small and incredibly numerous. We have far more moths than butterflies. Amateur moth buffs, even in eastern North America, can make new discoveries, especially if they are interested in behavior as well as identification. But those of us who are not night owls are pleased to see and identify numerous day-flying moths and search for their caterpillars. I’ve made only a start with tiger moths and woolly bears. By November most insects are either dead or hibernating, but some species, both native and alien, are aroused by the soft warmth of Indian summer. Once again the fields and forests sing with a quieter rendition of the grasshopper-cricket-katydid chorus of late summer and early fall. Bristly great leopard moth and woolly bear caterpillars unfurl from their hibernation quarters under loose bark or hidden in plant materials and crawl across our veranda. An occasional alfalfa or cabbage butterfly flutters weakly over the fields. Swarms of midges dance up and down in the warmth of the setting sun. Hibernating Halloween ladybugs emerge to swarm around us as we sit on the veranda, soaking up the rays. Every time I hear or see one of these insects so late in the season, I am especially appreciative of what seems almost magical. For a few days, I am reminded of all that was attractive in the world of summer because none of these stragglers bite or sting, not even the swarms of midges that seem to rise or fall according to their own rhythm. “Free swarms” form over a flat surface without prominent landmarks, and “ceiling swarms” consist of many midges swarming high over a large area from which vertical columns of midges descend. Entomologists disagree over whether the swarms are a mate-attracting behavior since the swarms usually consist almost entirely of males. 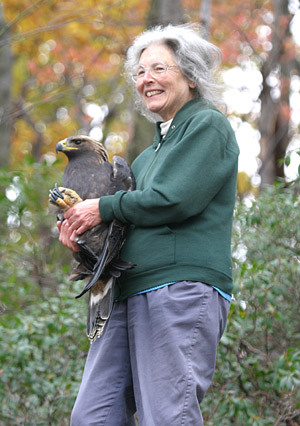 But some researchers have watched females dart into the swarm where they are seized and mated. Others say little or no mating takes place. At least one of the butterflies that survives to flutter through Indian summer would also have been familiar to Keats. The cabbage white or just plain cabbage butterfly (Pieris rapae) was introduced accidentally from Europe to North America in 1860. A small butterfly marked on its upper wing tip with black, the male has one black spot and the female two on their upper or forewings. Many people mistake these butterflies for moths because of their color and fluttery, floating, flight pattern. Europeans call this butterfly the “small white,” but they, like us, recognize it as a species that favors the Mustard family. Its yellow-striped, green caterpillar eats cabbage, broccoli, radish, kale, collard, and cauliflower plants as well as over 20 species of wild plants such as winter cress, peppergrass, and, more recently, another alien, garlic mustard. In the Mid-Atlantic states, their new-found interest in garlic mustard has lured them, for the first time, from their customary open, weedy habitat to the forest in search of the plant. The other late-flying butterfly, the alfalfa or orange sulphur (Colias eurytheme), comes from our own southwest. As alfalfa cultivation became common after the 1870s, this western species spread rapidly eastward, reaching the northeast in the 1930s. A yellow and orange butterfly that has multiple broods sometimes as late as November, it has been recorded as late as December 16 near Philadelphia. Warm spells often encourage its overwintering pupa to emerge prematurely so it is technically possible to see this butterfly long after its caterpillar food plants–alfalfa, vetches, and clovers–are finished. My latest date here is November 6, 1995, a day that dawned a cold, clear, 23 degrees after a spell of Indian summer. Katydids, however, had only begun calling again that year on the second of November when the temperature hit 66 degrees and continued to rise. Grasshoppers and crickets, also members of the Order Orthoptera, only sing near noon on warm days. They vibrate their wings as if they are arthritic, but even if they are silent and hidden in the tall grasses of First Field, the vigilant male American kestrel dives down and catches them. Every autumn a male kestrel hangs out on our telephone wire and watches for what several studies indicate are their favorite foods. Last November, though, the kestrel only appeared when the days were warm and hazy to prey on the fading singers. The same weather that re-started the Orthopteran singers also unfurled the bristly, curled balls of two closely related caterpillars already in hibernation. The woolly bear or black-ended bear caterpillar (Isia isabella) hibernates under a rock or log and is well-known in folklore for its ability to foretell the coming severity of the winter based on the size and color of its reddish-brown and black bands. According to Eric Sloane in his Folklore of American Weather, “the wider the middle [reddish-brown] band the milder the winter.” Others disagree, saying that if the caterpillar is mostly reddish-brown, the winter will be very cold. Still others base their prognosis of the weather on the lightness or darkness of the woolly-bears’ colors. If they are very light, the winter will be mild and short; if they are very dark, the winter will be severe. Scientists, on the other hand, maintain that the color variations depend on the caterpillar’s age and that older caterpillars have more reddish-brown hairs. The woolly bear caterpillar is a native species that changes into the yellow-brown Isabella tiger moth the following spring. Its close relative, another tiger moth, is called the great or giant leopard moth (Zeuzera pyrina) and was introduced from Europe before 1879. Like the woolly bear, it overwinters in caterpillar form but may come out on warm days. Covered with bristly black hairs, it reveals vivid red bands between its body segments when curled in a ball. It, too, changes into a striking moth, in this case, a white and black one with a three-inch wingspan and an orange-marked, blue abdomen. None of the insects I have mentioned, though, are as ubiquitous in late fall and throughout the winter, as the Halloween ladybugs, especially if you live in a white, clapboard house as I do. From the moment they begin hatching in early October until the following spring, we have these ladybugs in our lives. They swarm on the veranda when they first hatch and make periodic appearances throughout the month before hibernating outdoors beneath leaf litter, under the loose bark of trees, or in clumps of grass. But others prefer to move indoors. They are especially fond of old, white houses, probably because in eastern Asia they winter in the crevices of limestone cliffs. This ladybug beetle species first appeared here in October of 1993 and is an Asian immigrant (Harmona axyridis). It arrived, probably by boat, sometime before 1988 when scientists discovered the first breeding population in St. Tammany Parish near New Orleans. By October 1994, wafted north by wind currents, the species had made it to Elmira, New York, a year after its arrival on our mountain. Nicknamed the Halloween ladybug because of its orange color and the time of its swarming, the Entomological Society of America would like to rename it the “multicolored Asian lady beetle.” That name would emphasize its variable color scheme. Although most are yellow-orange, some are brick-red, and a few are even black with orange spots. Those ordinarily black spots not only vary in color but in numbers, ranging from few or no spots to as many as 20. The ladybugs need cool hibernating places so those trapped in our warm living quarters won’t survive, the experts say. Maybe not, but they are lively enough, flying and crawling over windows, sinks, and my house plants. Sometimes several hundred appear on our bay window, and in my husband’s warm study, they swarm on every sunny day. At first we thought they were cute, and I whimsically compared them to opossums because they roll over on their round, hard wing covers and play dead for several minutes after they are touched. Then they wriggle their legs, hoist themselves over on their stomachs and resume flying or crawling to wherever they are going. They are also prodigious predators on aphids and altogether a useful species. On the other hand, scientists are afraid that this aggressive species will wipe out some of our native species of ladybugs. My own patience has worn thin over the past several winters as their numbers have burgeoned. Some days I vacuum them up by the hundreds, but they are quickly replaced by others. “Ladybug, ladybug, fly away home” has become more than an old nursery rhyme to us as we fervently wish they would fly back to Asia where they came from. Instead, we watch this alien species take over our home every winter, giving us more communion with the insect world than we would like.